Following on from the first shopping list, here are the explanations for why the items on the first shopping list are needed and what to look out for. The best aquaria for beginners are long, rectangular ones as most beginners do not know which way the hobby will take them and these are the tanks which give the most stocking options. It is best to go for at least a 90×30×30 cm (3×1×1 ft) tank as anything shorter will restrict you even on many of the “popular” fish. 60×30×30 cm (2×1×1 ft) is the absolute smallest that I can recommend to any beginner as setups smaller than that will not tolerate mistakes. Taller aquaria will not allow you to keep any larger fish, nor (really) any more fish, but the extra water will result in more stable parameters. Tank height does matter for some fish, such as Pterophyllum spp. (angels) and Symphysodon spp. (discus), but they should have quite large tanks anyway (for most species starting from 150×60×60 cm (5×2×2 ft)), so are usually not kept by beginners. Tank width/depth (the front to back measurement) does not matter too much for tanks tanks under 120 cm (4 ft) as they are too small to keep any fish that are large enough to have trouble turning around in a standard 30 cm (1 ft) wide tank. 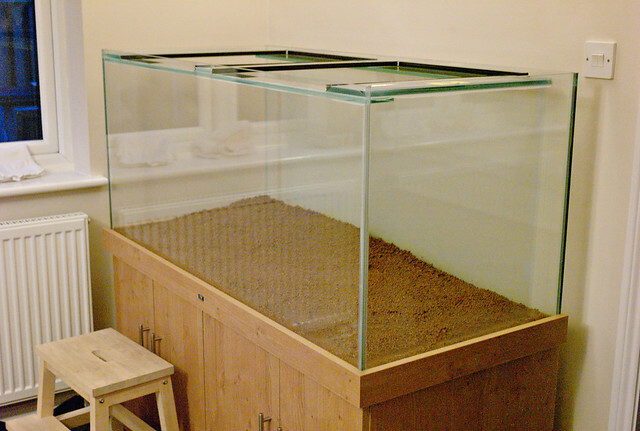 Odd shaped tanks and ones with low surface areas should generally be avoided if one does not want an extra level of difficulty and more stocking restrictions, this includes cubes, hexagonal prisms, “picture frames”, bowls and tanks with artificially reduces areas such as the Fluval Edge. Usually, the filters that come with the aquarium kits are fine, but if you do not have one, then I recommend external filters. I prefer to use Fluval internal filters or Eheim external filters. If the filter has activated carbon inside it, then the activated carbon should be removed and replaced with a media that does not affect the water while providing a high surface area for bacteria, such as porous ceramic media or sponges. It is only worth spending one’s money on liquid test kits, or maybe digital ones, but the strips are usually very inaccurate and can give false positives and, more worryingly, false negatives. Your first dechlorinator should be one that claims to “deal” or “neutralise” chlorine, chloramine, ammonia and nitrite. These are usually about the same price as ones which only work on chlorine and chloramine and add an extra level of protection because one of the by-products of chloramine removal is ammonia, so if your water supply has chloramine, as many in Europe do, then using a more traditional dechlorinator would leave the new water with ammonia in it, which would make the water changes during cycling redundant. Also, tap water can contain both ammonia and nitrite, both of which are harmful to fish. Any household ammonia that does not contain anything other than water will do. Apparently the test to see if it contains other things is to shake up the bottle and see if it produces foam: if it does not, then it is what you want, but if it does, then it contains other constituents. I have never tried this method as I have never seen ammonia that contains other cleaning agents or perfumes in it. In the UK it is possible to buy ammonia from Boots, in the USA from Ace Hardware and in Germany from eBay. Anything that is clean will work, starting from filter tubing all the way to garden hoses. If you plan to refill the tank straight from the tap, then it is worth getting a short length of tubing and a longer one or a python system. Useful for lugging around water and for acclimatising fish. The bucket needs to be a new one and must never be used for anything other than fishkeeping to avoid contamination and poisoning the fish. Alcohol and digital thermometers are the most accurate. Avoid liquid crystal thermometers as they measure the temperature of the room and glass, not the water. Almost any heater is fine, I prefer to use NeWatt heaters because they are ceramic, so are more difficult to break and are less likely to fail than a glass heater. A good heater should last you a very long time (my oldest working heater is probably around 15 years old), while a bad (normally cheap) heater can break very quickly (most of the “cheap” heaters that I have had have failed in under 5 years). If you use a glass heater, make sure you have a heater guard for it: this is a plastic cage that goes around the glass, preventing the fish from touching the hot heater and burning themselves. A heater guard will also reduce the risk of you or a large fish smashing the heater. As a very general rule of thumb, one should have approximately 1 watt of heater per litre in a well heated house. So for our 90×30×30 cm (3×1×1 ft) example tank, which is approximately 80 litres in volume, we need an 80 watt heater. Since most heaters come in 75 or 100 watts, I would chose the 75 watt heater if I knew that the room was always warm, or the 100 watt heater if I could not be sure that the room is always heated. Another option would be 2× 50 watt heaters. Research the substrates and go for your final choice right from the start. I recommend sand from a garden centre because it is usually no different from aquarium sand, but is considerably cheaper, and allows for a much wider selection of stock. I prefer black, but dark blue also works well. White is more difficult to pull off, and the printed backgrounds usually look just tacky. At the very least, a background will hide the equipment cables, and it can even make fish more bold. Next time, I will be writing a post-cycle shopping list. Once the water is in, it is almost clear right from the start. I used a plastic bowl for pouring the water on to, so that I would not disturb the sand too much. The whole process of washing the sand and adding the water took about 45 minutes, it needed about 120 litres of water and I finished it off with 15 ml of dechlorinator. Last to go in were the filter and heater. 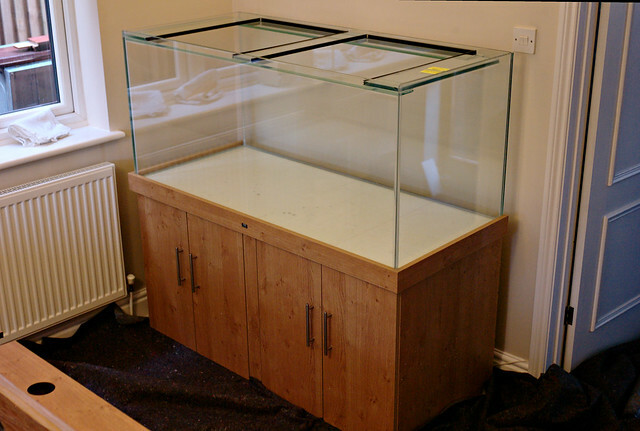 The aquarium is currently on the floor (that’s my old AquaOne next to it, which I am trying to sell) because I do not have any small table which is sturdy enough to take the 70 odd kg that the full aquarium weights (about 55 kg of water and 15 kg of substrate), so I am planning to build a wooden stand for it in the near future. Substrate choice partially depends on personal preference, but mainly on whether the fish you are planning to keep have any specific requirements. For example, loaches, Corydoras and earth eaters are a few of the fish which benefit from fine substrate because they will sift it through their gills while looking for food. Some loaches will even bury themselves under the sand, while some cichlids will only spawn in pits which they have dug. 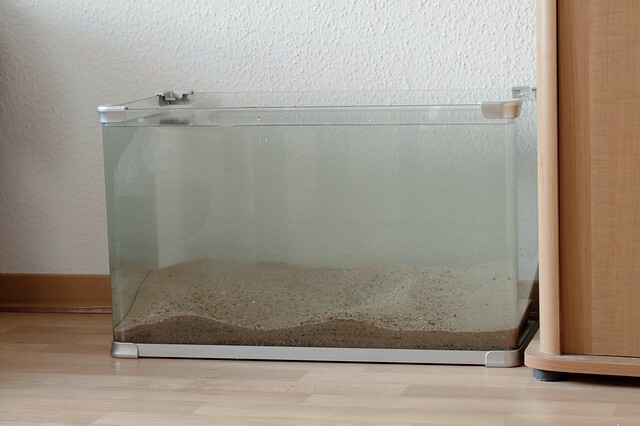 As I am still undecided on which species of fish I will have for the bottom of the aquarium, safest choice is sand. I have bought some play sand, which is aquarium safe and is considerably cheaper than aquarium sand. Regardless which substrate one chooses, it is important to make sure that it is not dyed because most dyes will come off with time and some may be harmful to aquatic animals. Another important point to consider is that some substrates will alter the pH of the water. For example, peat will result in the water becoming more acidic, while crushed coral will have exactly the opposite effect. These properties can be very useful to for adjusting the aquarium pH in the long term, but I would still recommend that anyone new to fishkeeping should avoid these and pick fish which will be happy in the water parameters that one already has. Normal sand and gravel are usually inert, so have no effect on the water chemistry. The first thing to do with new substrate is to clean it: this can be done by placing a small quantity of it into a bucket and rinsing it with water until the water runs clear even when one stirs it. If the substrate is not clean enough, it will cause the water to become cloudy because of the dust in it, so I usually give it an extra rinse before adding it to the aquarium. The water is still likely to be slightly cloudy for a couple of days even though the substrate has been washed, so it is possible to temporarily add filter wool (also known as floss) into the filter, so that the water clears quicker. Luckily for me, this play sand was quite clean, so each 3 litre lot took only three goes to clean, instead of the more usual 6-8. Before draining the water after each clean, I waited a few seconds to let the smaller bits of sand, which were not the dust which can make the water cloudy, settle. Wet sand will often look darker than dry sand, so it is important to take that into account when picking a colour. 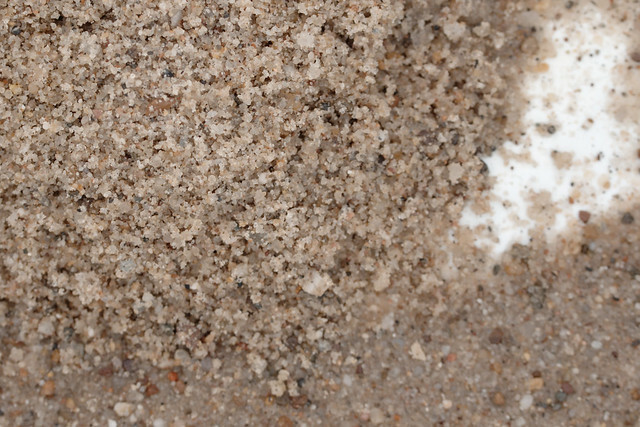 In the photo above, you can see the dry sand on to top with the wet sand below it. The sand which was available at my local DIY store is a dull brown with specks of larger dark and pale stones. I think this gives it quite a natural look, which is what I am aiming at.